Added on February 28, 2014 by valerie dalling. 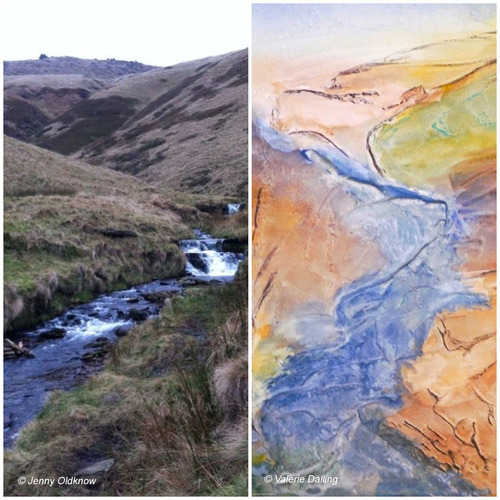 I had a fabulous walk in Edale recently, with the very talented artist and tutor Jenny Oldknow. It was very much an experimental and fun day for both of us, as we spent time enjoying our surroundings, talking about the landscape and taking photos along the way, Jenny used her mobile phone, I had my Lumix. Back in her studio a couple of days later it was equally as fun turning the tables as I had a go at painting my very first Derbyshire landscape through Jenny’s photograph, and I was pretty chuffed with the result. Although I had in mind an abstract painting, for me I was surprised how much detail I had still included, as this isn’t always the case with my photographic work. While Jenny’s photo was at hand and the paper had been prepared to help guide me, I still wanted it to be my own interpretation, my memory of the day. Like Jenny, my focus was also the water, as I do tend to spend so much time by it, and I think this is why I wanted it to dominate, and yet what’s really interesting for me, is that although I still chose to include the skyline in my painting I didn’t include The Woolpacks which can just be seen on the horizon in her photograph…it never even entered my head. Should I have included these rocks, as they are after all an important part of the landscape? What effect if any, would this have had on my painting? I am always quite conscious when making photographs of what lies within the frame before pressing the shutter release, making sure everything within it is important and relevant to my picture…so what about when painting from photographs even if they are only for reference? What’s different? Do I see or think differently when I have a paintbrush in my hand rather than a camera? Interesting thoughts to ponder…I look forward to the next time I pick up the paintbrush with Jenny.